Why Don’t Athletes Shake Hands in the Olympic Village? The fear of illness among Olympic athletes can be as strong as the fear of losing, so the code of “zero contact” is well practised within the Olympic Village. Less physical contact with other athletes means less chance of infection. The ‘no shaking hands’ policy extends to the football pitch, where individual bottles labelled by player number are designated to each player in order to minimise cross contamination from sharing water bottles between team members. The International Olympic Committee (IOC) now actively encourages athletes to frequently wash their hands to minimise infection throughout the competition. This fear of illness among Olympic athletes is not without reason. Despite being in prime physical condition, elite athletes are at a higher risk of infection than recreational athletes. Intense physical activity can suppress the immune system, meaning infections are more easily and frequently picked up. Infection can reduce the quality of athletic performance as well as lead to missed training days, which can further impact performance. In other words, one illness can reduce an athlete’s competitive edge and chance of winning gold. The International Olympic Committee established a surveillance system to measure the frequency of injury and illness due to the impact injury or illness can have on competition outcomes. Studies using this data have found that around 8% of athletes incur an illness during the Olympic Games and the majority of these illnesses are caused by infection (Soligard 2015, Engebretsenet 2013). The studies found that frequency of illness varies between sports and that women are much more likely to become ill, although the specific reasons why more women than men become ill are unclear. The increased infection risk for athletes, combined with the impact illness can have on competition performance, means that improving immunity through nutrition can be especially valuable to training regimens. During training and competitions, athletes push themselves to the brink with extremely heavy training schedules. 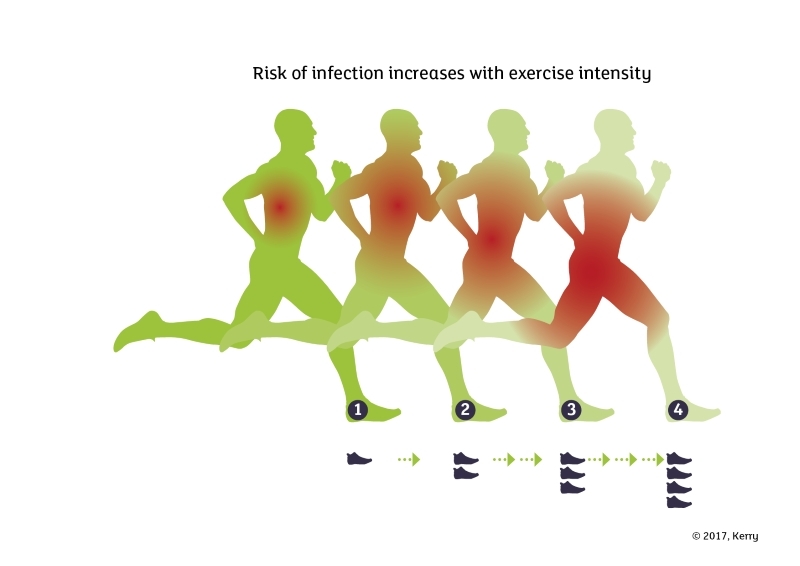 The relationship between exercise and infection risk is complicated. Although moderate intensity physical activity has been shown to improve immune function, strenuous bouts of prolonged exercise and heavy training loads can put the body in a stressed state, which can have a negative impact on the immune system. This is due to several factors, one of which is the result of increased levels of circulating stress hormones following an intense training session, such as cortisol and adrenaline, which inhibit the immune system (Burke and Deakin, 2010). Intense exercise results in an imbalance of immune cells in the body, which weakens the immune response and makes infection more likely (Martin et al. 2009). Diet and nutritional strategies can be as important as natural talent and physical training when it comes to athletic performance. In addition to facilitating exercise recovery, promoting training and adaptation, and optimising body composition, nutrition can also play a key role in prevention of illness. Adequate intake of carbohydrate, protein and fat are crucial to maintain immune function. Protein is required for cell replication and synthesis of immune cells. It is also essential for the production of immunoglobulins, acute phase proteins and cytokines, which acts as a critical part of the immune response. Carbohydrates also play a role in immunity for athletes. Carbohydrate is essential to fuel muscles during a hard training session, and is also the primary fuel for our body’s immune cells (Gunzer et al 2012). In addition, low blood glucose concentrations during intense training sessions results in higher levels of hormones, which can suppress the immune system. Carbohydrate requirements will vary throughout the training regime; requirements are higher in the lead up to an endurance event (i.e. carbohydrate loading) and during the acute recovery period. As a result, matching carbohydrate intake with daily fuel requirements is an important strategy to support immune function in athletes. Read our blog ‘Three Things You Need To Know About Protein For Exercise Performance’. Micronutrients that also impact immune responses include vitamins A, C, E, B6, B12, iron, zinc, magnesium, copper and selenium. 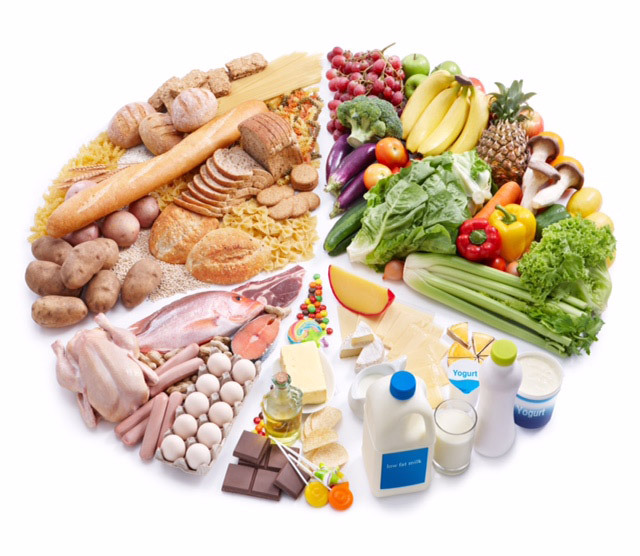 A varied and balanced diet, which includes plenty of fresh fruit, coloured vegetables including leafy greens, whole grains, legumes, nuts, seeds, lean sources of meat, fish, eggs and dairy will ensure micronutrient needs are met efficiently. Vitamin D also plays a role in immunity. Dietary sources include oily fish and eggs, but most of our vitamin D is made in our skin when it is exposed to sunlight. Vitamin D supplementation may be beneficial in reducing the risk of infection for athletes participating in winter sports (He et al 2016). Although numerous other nutrients or supplements have been studied in regards to immunity for athletes, more studies are needed to better understand their impact on immune health. 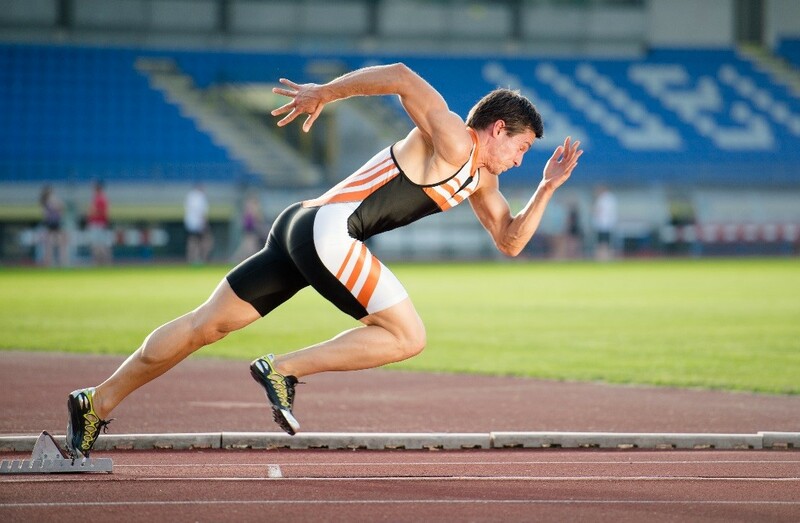 Wellmune is a food ingredient shown to reduce infection risk in athletes. Read our white paper about Wellmune. Although elite athletes are at an increased risk of infection, nutritional strategies may reduce this risk and allow athletes perform to their maximum potential. 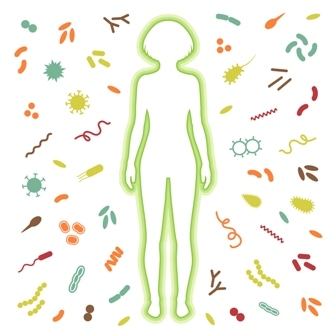 As the science around nutrition and immunity continues to develop, product development opportunities to reduce infection risk in athletes and improve performance will become more clear. Gunzer W et al. (2012). Exercise-induced immunodepression in endurance athletes and nutritional intervention with carbohydrate, protein and fat – what is possible, what is not? Nutrients;4(9): 1187–1212. He CS et al. (2016). Is there an optimal vitamin D status for immunity in athletes and military personnel? Exerc Immunol Rev;22:42-64. Martin SA et al. (2009) Exercise and Respiratory Tract Viral Infections. Exercise and Sports Science Reviews. Robson-Ansley P et al. (2102) Prevalence of allergy and upper respiratory tract symptoms in runners of the London marathon. Medicine & Science in Sports Exercise.